Kindle Fire e-readers are everywhere. My grown daughters have them. Friends and neighbors are getting them. I just didn't understand. What's so great about reading a book on a computer screen I wondered. Until I got to play with one. Oh Kindle Fire, you are hot! 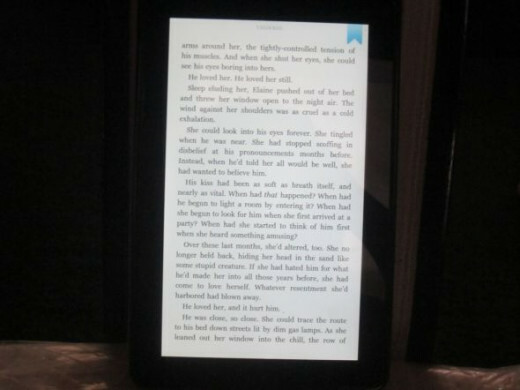 Yes, yes you can read books on a clear wonderful easy to read screen. Done with the page, just tap and there's the next one. And yes, you can read your old favorites or great new books. Yes, you have to pay for some of the books you might want to read but we have been paying at Barnes and Nobles and bookstores for years. Looking for free books and low priced books, or how about books you can borrow like you do from your Public Library, no problem all of that is available too. Want to go online and check your email, watch a video, look something up on the great world wide web, well your Kindle Fire can do that too. Love magazines in color with great pictures and fun recipes, articles and stories, then you can subscribe to your favorite magazines on your Kindle and have it instantly, yes instantly delivered. And that is just the beginning of this technological wonder. I love, love my Kindle Fire because yes, as soon as it was in my hands, I had to have one too. 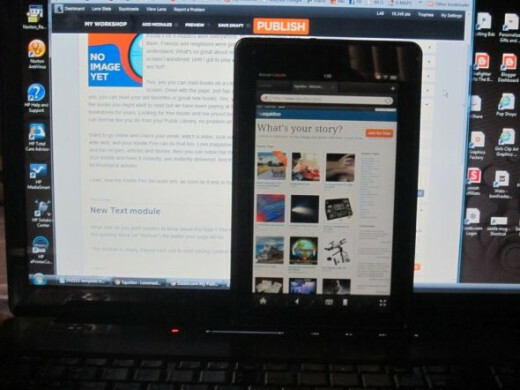 This is a photo of me with my own Kindle Fire in my hand, look how small, thin and beautifully clear it is. No wonder I love it so much and I think you might too. This will probably be the least technical review you will ever find about the Kindle Fire. There are many wonderful and detailed opinions and reviews online especially at Amazon. I will definitely provide you with links directly to those reviews, to information about the Kindle Fire and it's new family generation of Kindle Fires and of course, links to where you can be lucky enough to buy one for yourself or someone you love. But this review is called I Love My Kindle Fire! I cannot believe the enjoyment in reading again. Easy reading, easy page turning and even easy bookmarking. Did I mention easy, easy set up and management, well I have to tell you just in case you are worried you're not tech savvy enough, don't worry. Books magically appear on your kindle after you purchase them when you next turn it on. So easy to manage your music, store files in the Cloud and even so easy to connect to a WiFi network. Easy, portable, fun and lightweight. Yes, I love my Kindle Fire! 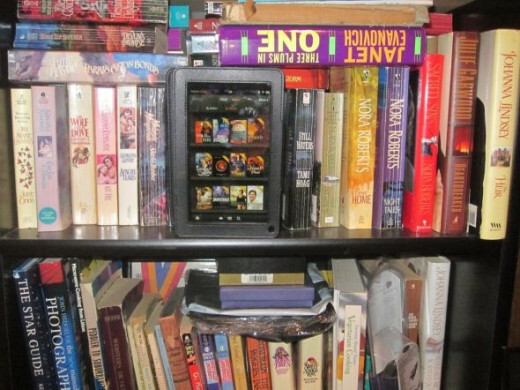 Here's my Kindle Fire on an old book case of mine. I have tons of book cases holding books I love, books I meant to get a chance to read, books I will never read, recipe books, DIY books, lots of books. Taking up lots of room. Tons of paper and trees and room! My Kindle Fire has hundreds more books stored inside of it than on all of my book cases put together. Yes, hundreds of books. Romance books, classic novels, recipe books and DIY guides. Stored right inside. This is not the future, this is amazing wonderful technology right now and I love it! If you prefer a sleeve to store your Kindle Fire in this is a great option. Very slim and lightweight and will keep you protected when traveling and not using. Now you can store your books in a cool new book case that doesn't take up much room and yet you can store hundreds of books in them! These cool book cases store your kindle and protect them at the same time. Cases and covers are available in tons of styles and colors. Some of pockets to hold important papers you might need, some can be used as stands both horizontal and vertically which can be really useful. Many of them are just personalized, colorful additions to an already wonderful ebook reader. Fabric design cover for your Kindle Fire is elegant, protective and lightweight. This cover also has an inside pocket for storing notes, etc. You don't need to use a stylus with your Kindle Fire but I find that I do like to. Even with my protective glare proof cover in place I still don't want to get fingerprints on the front display, although it all cleans and wipes off very easily if you do. My stylus hooks right onto the little band of my cover so I have it with me wherever I go, otherwise I know I would be looking for it all the time. These cool accessories are available in lots of colors and sizes and some even are also real pens for total convenience. Three great color stylus choices all in one pack for a little Kindle Fire flair. Works great on Kindles, Nooks, ipads and tablets. Here's my Kindle Fire hanging out with my laptop computer. Check out the size, how small and thin it is. Perfectly portable for traveling and even going room to room at home. The Kindle Fire is not a substitute for a full computer but if you have ever dragged your laptop with you to the doctors office or on a plane then you know that unless you need to do some heavy duty work business the Kindle is way easier to bring along as your traveling companion. Finish reading your book, your magazine, listen to some music or catch up on your emails while you are on the go. Kindle Fire covers and cases in great colors, interior lining and inside pockets. This one also has a magnetic snap closure for extra protection. 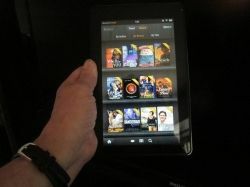 If you can't bear to be without technology today, would love to be able to read all the new lenses or work on your own, or if you go crazy without access to your email and Facebook page then you will love how easily the Kindle Fire connects to a WiFi network. You do have to have access to a network because it doesn't have it's own network card but when you are in the area of one, it helps connect for you. I find the speed terrific and have never had a problem accessing anything online. Even in it's small and thin size, see how cute it looks next to my stuffed animals, the resolution is gorgeous, photos look terrific and the screen is just never blurry or uncomfortable. I take my Kindle Fire with me everywhere. Even if I don't have a WiFi connection available I can read my books, check out the latest edition of my magazines, play games, you name it there's always plenty to do. Personalize your Kindle Fire while you protect it with these very cool, easy to apply skins designed for the inner you. Express your personal style and defend your device with a custom Amazon Kindle Fire skin! 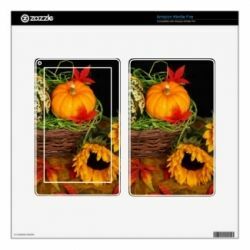 Made of ultrathin and super-durable Avery MPI vinyl, Zazzle Amazon Kindle Fire skins feature patented air release technology for a smooth, zero-bubble surface that protects your device from everyday scratches and scuffs without adding bulk. Printed and laminated with the highest quality standards and precision fitted for your Amazon Kindle Fire, this custom skin will look sharp and brilliant with your designs, photos, and text. Very cool Kindle Fire case is very protective and double bonus, turns into a stand at multiple angles for your reading convenience. Yes that's what I do. I work out with my Kindle Fire. I used to have to pop the DVD into the DVD player, turn on the tv, go into that room and wait until no one else is watching that particular TV with the DVD player, but now, I can work out wherever and whenever I want to with my Kindle. Here I am in the picture above working out, OK it's not really me but this really is my favorite workout playing on my Kindle. I found and bookmarked my favorite workout on YouTube and I just turn on my Kindle Fire, tap my bookmark and voila, I am working out with great sound, nice picture and super convenience. Disclaimer: Turning on your Kindle Fire to watch your favorite workout while eating potato chips and not working out too will not help you lose weight! When the Kindle can do the workout for us it really will be the best selling in the world. Stylus quality works really well on drawing and fine detailed apps as well as keeping your screen free of fingerprints and smears. Here's how a page in your book looks. Easy, easy to read. And you can change the appearance. You can make the font size bigger or smaller and make the screen brighter or darker. In the top left you can see my book mark. You just tap the top of the page and your book mark appears. You can highlight, bookmark specific areas if you want to go back to that someday. You can skip ahead or go back to the last page, hey no cheating! And don't worry if you don't remember where you were, just go to your last bookmark and start reading whenever you are ready. If you close this book to read another or get a great recipe to cook up, your book marks will be ready when you are. Take a page from my book of experience, I love reading and now it's even better than ever. This is a great stylus option for busy professionals on the go offering a smooth and well designed experience with the Kindle Fire screen and is also a ball point pen to use on your regular papers and notes, no need to carry more than one great device. I just can't even describe how really beautiful everything looks on my Kindle. Whether it is photos on my Facebook page, pages of the magazines I subscribe to, games that I play and graphics on web pages, everything looks just stunning. 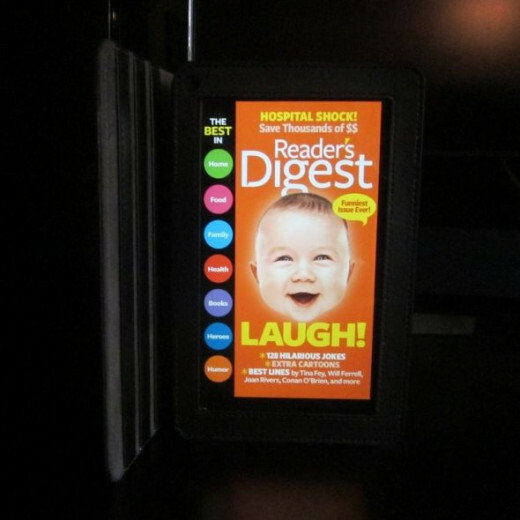 This is a photo of my Readers Digest cover on the Kindle. I didn't do it justice but I was hoping it would make you smile too. Free Kindle books are available all the time and many of them will be just what you are looking for! Great authors, new and old, terrific stories, classics, recipes, novels and biographies are featured as free Specials if you know where to look. The links below are fantastic. They will send new free book listings right to your Facebook page and/or your email address. Besides Free (!) books they also feature a great list of discount book specials. Many of the offers only last a limited time so you have to be right on it to snap them up and download them. They are all great resources for games, music and Kindle Fire updates as well, so please you really want to check them out! This is where Kindle Fire owners come to find Apps, Tips & Tricks, and Books! Free and bargain Kindle books with direct links to the books and the download, great reviews and suggestions from the Facebook Fans too. Kindle free and bargain books, links for Nook resources. Best sellers, help area for new and seasoned users, bargains and really good kindle resources. You definitely want to invest in a screen protector! 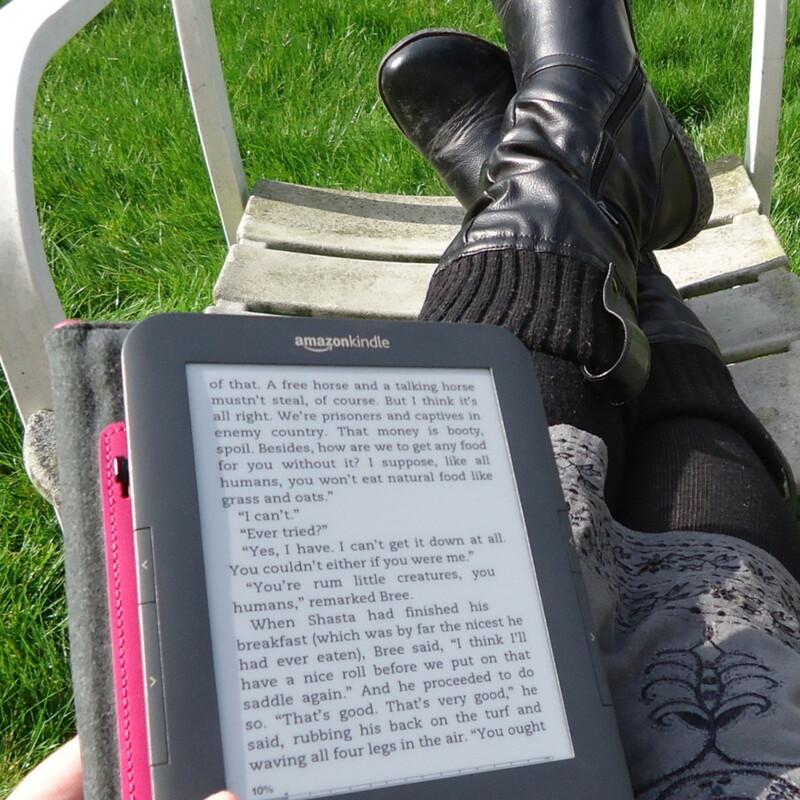 It will keep your Kindle safe and clean from fingerprints, smearing, scratches and scuffing. Many of the screen protectors offer anti-glare finishes and they are just about invisible one you put one on. Lots of them will even include a free cleaning cloth as well. 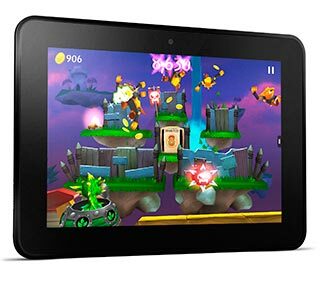 Love some games on your Kindle Fire, no problem Amazon has an app for that. 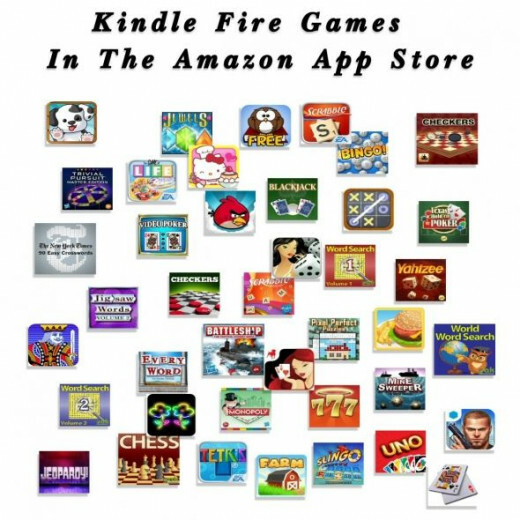 Featuring literally thousands of game apps for the Kindle ranging from free to very inexpensive all your favorites and probably some new great ones are available for download. Immediately. Right to your Kindle Fire so you can start playing when you are ready. The photo above shows some of the featured game icons right off of Amazon but whew, I was running out of room there are tons more. Some of the games offer single player, multiplayer so you can play with a friend on their Kindle while they are sitting right next to you and lots of games can be played online with strangers and new friends you have never met before. So go ahead, gamble big bucks on the slots, poker or roulette. Get some Angry Birds, Mine Fields or choose some crossword puzzles, soduku games, word games or blow it all in a game of Farkle. Great fun games for kids too, you can have them downloaded and handy to share with the family, perfect for the restaurant, waiting rooms or just a fun sharing break at home. 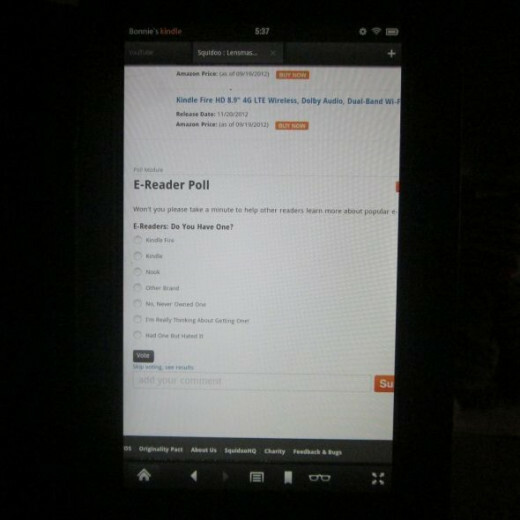 E-Reader Poll - Photo of the Poll on my Kindle! 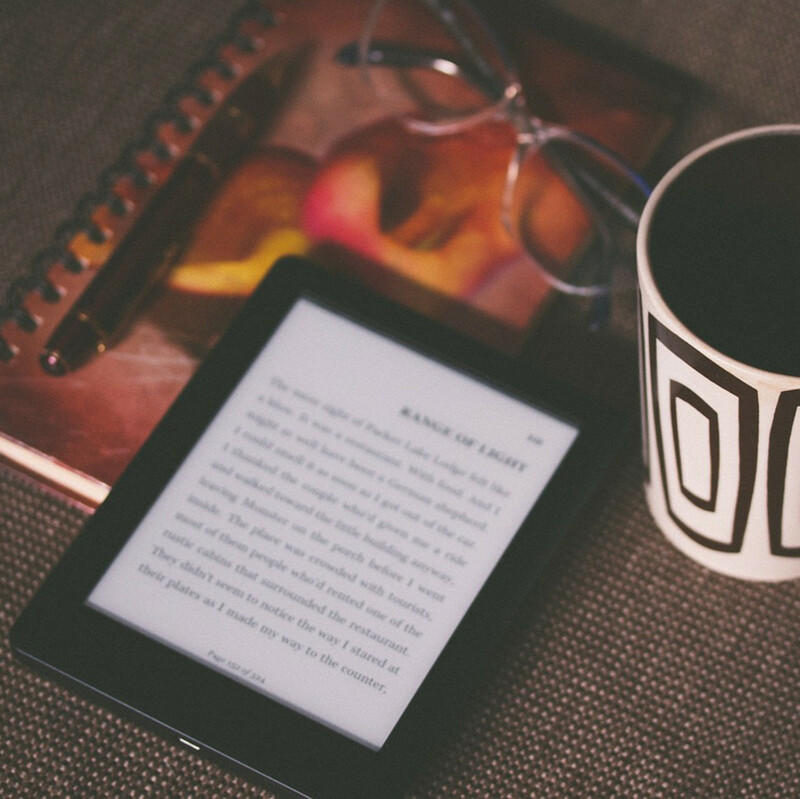 Won't you please take a minute to help other readers learn more about popular e-readers? 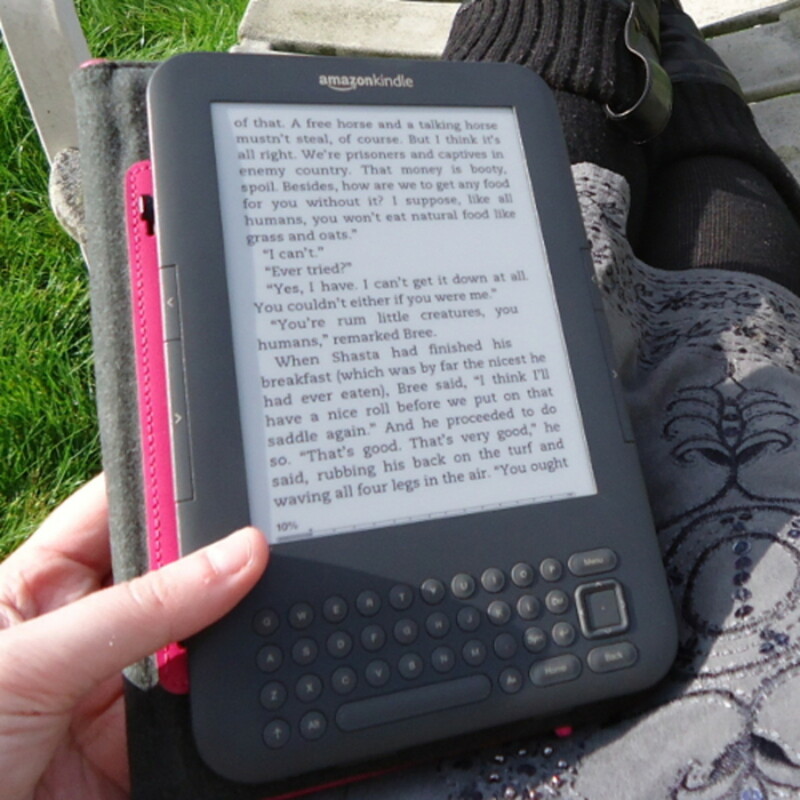 E-Readers: Do You Have One? I'm Really Thinking About Getting One! Not only is the next generation of Kindle Fires landing right now but they are awesome! More HD resolution and stunning graphics, dolby digital sound, skype with friends and family, faster and better WiFi with dual band support, integrated blue tooth, whew the list goes on and on as does the new developments of technology that Amazon keeps building and improving in their Kindle Fires. Now also available will be Kindles with 8.9" screens, more features, faster processors and yes, a Kindle HD Wireless that will have it's own WiFi card and network. We are talking tablet control and still all the unbelievable features from Amazon. Check some of these out too to see what's around the corner at Amazon. Hope you enjoyed my review about the Kindle Fire e-reader or maybe learned something that will help you find some free books or games or choose a new Kindle Fire case. 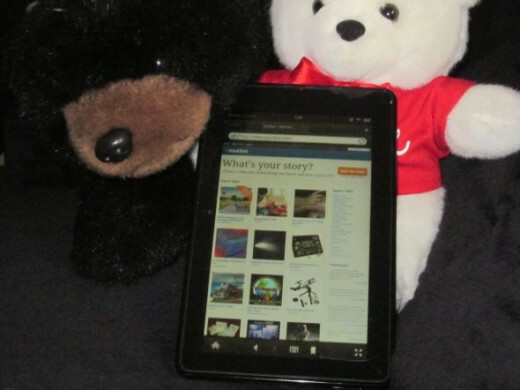 Do you have a Kindle Fire, would you consider buying one now? We would love to hear from you and learn a little more about the new world of reading technology from your point of view!